This post qualifies as our first Get Wet Sailing Throwback Thursday (#tbt). 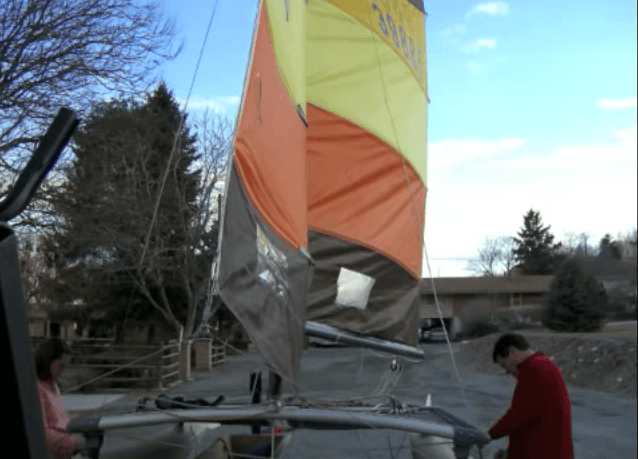 Below is the first video we ever produced as Get Wet Sailing, Hobie Cat 16 Boat Repair. It’s simple, it’s all still pictures, but it shows the progress of all the Hull repair work we did on our First Hobie 16. Bargained it for $900 from the guy down the street. Close to two months later we actually got it in the water. This was an ’79, which meant it had lots of soft spots we had to fill, sand and fill again and eventually paint white (much better than the 70’s golden brown). It was a lot of work, but a lot of fun too. We eventually sold it for the ’88 Hobie we have today which we love. The ’88 has close to no soft spots to be filled. So nice.